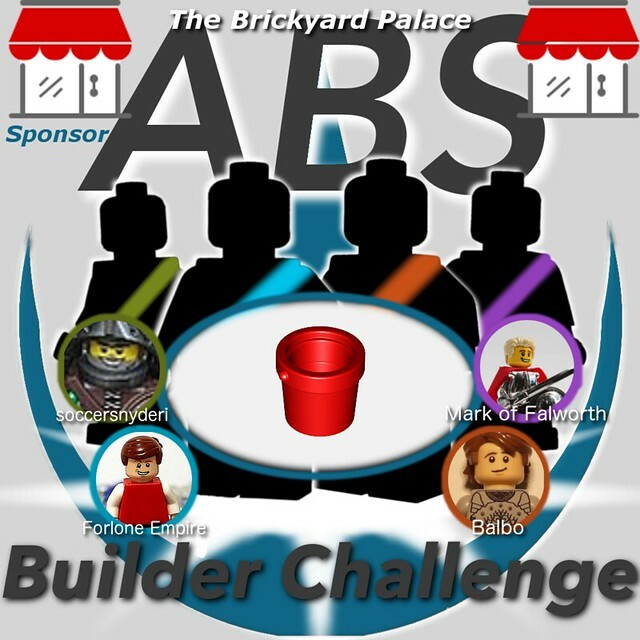 ABS Builder Challenge Round 2.1 has come to a close, and what a battle it was! We want to thank The Brickyard Palace BrickLink store for sponsoring this round! Be sure to visit their store when looking for pieces for your next project. The competitors this round were Mark, Isaac, Eli, and Patrick, and they built a total of 26 creations. Now that the judging is over, we can announce the winner! ABS Season 2 Round 1 winner is none other than Isaac Snyder! The battle was indeed fierce, and the order of who scored highest between the judges varied more than any other round. Still, Isaac was the clear winner, winning by 2 studs. Keep reading for the breakdown of the scores and also to see the responses to interview questions from the competitors. As with previous rounds, we asked the competitors 3 questions about the competition. It's always interesting to hear from fellow builders' thoughts about competitions and their building processes. Isaac - Being pushed to build things I normally wouldn't, due to the interesting red bucket as the seed part. In general, I like to explore various themes besides castle, but often never get to them unless I have some extra motivation from a contest or challenge like this. Eli - My favorite aspect of the competition would have to have been trying to use the seed part in new and creative ways that highlighted the part but still added to the overall creation. I think it is easy to plan a build based on a preconceived idea or a familiar theme, but in this contest I focused on beginning with a single seed part, and building my ideas around it. The contest challenged me to build more outside my comfort zone, and I loved that. Mark - The fact that the contest got me building again after a few months of inactivity. That and being able to compete with a bunch of great guys with a challenging piece. Patrick - My favorite aspect was finding new ways to use the seed part. Due to the fact that I used the red bucket quite often in my last creations (but always just as a bucket), it was a nice challenge to find new ideas to use that element in different themes. Isaac - I was surprised for sure, and while the bucket has a very useful shape, I thought it would likely be difficult to incorporate due to the limited connections. I didn't have a lot of ideas right away, but by the end I had way more ideas than time to realize them. Mark - At first I was pretty stumped and annoyed by a single connection piece. But after a few days it wasn't so bad at all. And I was able to come up with more ideas than I had time for. Patrick - On the one hand the bucket has an interesting shape, but on the other hand theres only one connection point with the element, so its quite difficult to use it in an legal way. Overall I think the bucket was an interesting seed part for the challenge. Isaac - There were a few that I was particularly pleased with, but the Boy's Room is my favorite. I put the most time into this build, and think it paid off. It was a fun very build in that were loads of different mini builds that went into the scene. Although it was a challenge coming up with enough details to make the room look appropriately messy! One interesting point to the build process, was that I wanted to include a hallway that could be seen in the background to give the room more depth. I was able to include it, but due to the angle at which the bedroom door opened, it wasn't noticeable in most pictures. Eli - My favorite build I made this round was the hummingbird feeder. 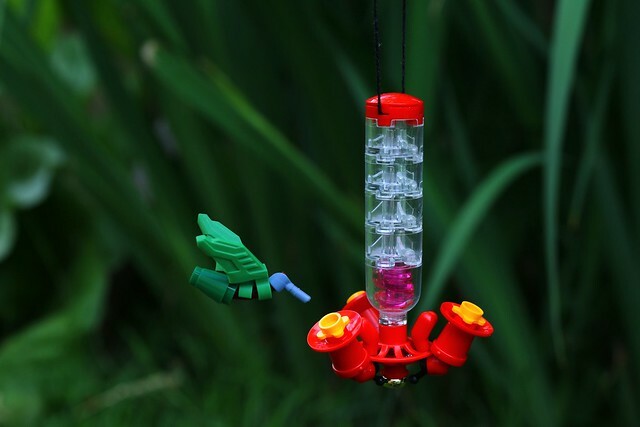 I came up with the idea while I was in the garden center of local store, I saw the humming bird feeders and thought "hey those are red, I can do that!" I spent several hours with tons of tiny red parts and other parts laid out simply trying out different combinations until it looked right. The most challenging part was figuring out the connection with the minifig hands and the wheel hubcap. 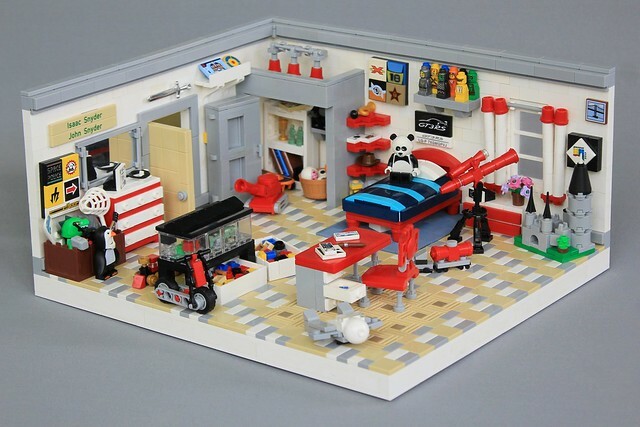 While the build itself isn't the most sophisticated, large, jaw dropper, I think sometimes the smallest builds have some of the biggest heart. Also photographing it was a lot of fun since I was able to go outside and enjoy the sun, and Lego, at the same time. Fun fact: While I was taking photos I took a break to go grab something and my Grandpa saw a real humming bird fly up to it! Mark - My favorite build from this round would be the red alien hives. I came up with the pattern on day one and was waiting for a good application of the technique. I think it's my best use of the seed part which is the most important aspect of this contest. Patrick - All in all I think my favorite MOC is my first entry "A Long Expected Gathering". I wanted to make a LotR MOC for a while and after I saw the seed part, I immediately had the idea to use the red bucket as a party decoration. The Shire is my favorite place in Middle Earth and I really had a lot of fun building this creation. We'd like to thank the competitors for participating in this competition! 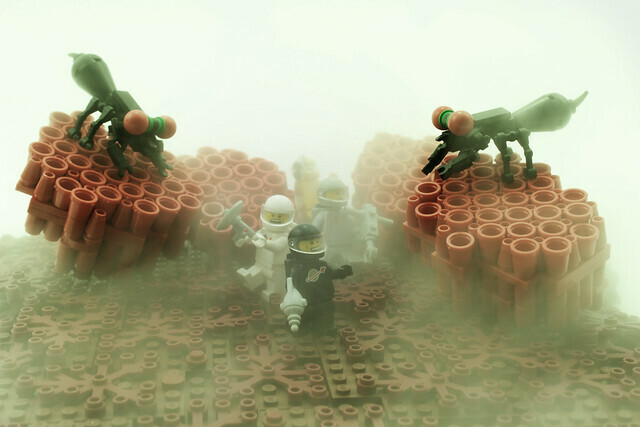 To see all 22 creations, visit the ABS Builder Challenge Flickr group. Don't forget to visit our sponsor, The Brickyard Palace, at their BrickLink store soon! If you're interested in participating in a future round, we have an applications thread on Flickr where you just let us know you're interested. Don't go away, season 2 round 2 is just around the corner!